It is a sad fact that 1000 women in Queensland are diagnosed with gynaecological cancer each year. Of these, 40% won’t survive. Whilst the numbers of women afflicted continues to grow, government funding into research for cures to these cancers is diminishing. 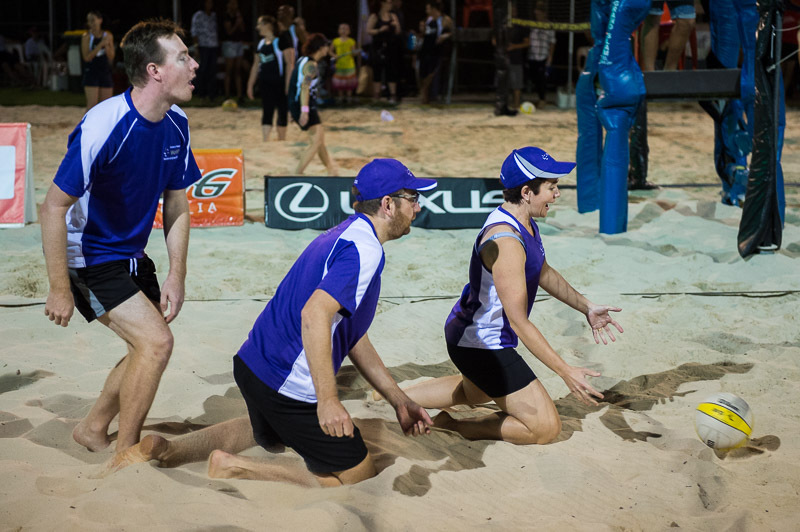 As part of the network of Queensland Gynaecologists, this is an issue close to the hearts of both Pauline and Melinda, and prompted us to enter a team in the Battle against Ovarian Cancer beach volleyball tournament this year. Now for those of you who know our Doctors, you may know that volleyball is not the first thing they think of for relaxation. Or the second, third, or probably twentieth. Despite their concerns for their lack of ability and possible injuries, they decided this cause was worth the risk to body and ego, and joined with another of our Wesley gynaecologists, Dr Michaela Lee (who is part of our on call roster), to form the medical backbone of our team. Joined by partners and friends of eXXpectations, our intrepid team set out to discover if you can learn how to play volleyball with no previous experience. . . .
Now before we get to what happened, we should look a bit more at why it was important. Gynaecological cancers account for approximately 4500 new cases each year in Australia, and 1 in 22, or about 5% of all women, will be diagnosed with some form of Gynaecological cancer during their lifetime. As general obstetricians and gynaecologists, our doctors see many women who present with the early signs of these cancers, and help them to move into the gynae oncology system. By seeing these occurrences so regularly, Pauline and Melinda are constantly reminded of the need for further research into cures and treatments in this area. Headed by Professor Andreas Obermair, the Queensland Centre for Gynaecological Cancer (QCGC) is searching for these solutions through research and clinical trials to try and reduce the rates of Gynaecological cancers and improve survival rates. If you would like more information on the QCGC, please follow this link: UQ QCGC – Queensland Centre for Gynaecological Cancer. Simon, Chris and Pauline keeping their eyes on the ball! So, we know you want to know how they went. Despite our low expectations (no pun intended), our team had both a great time and a solid performance. In a complete shock to all, we won our first game. For a group with 5 out of 7 players having not played prior to the tournament (other than our highly professional training sessions) it was a surprise that was very happily accepted. Throughout the night much fun was had, with a close loss following our opening win, followed by our final game of the night. Needing a win to move onto the next round, there was much anticipation in the air of the possibility of another win against a team which should have included a friend of eXXpectations, Dr Matt Smith from the RBWH. Unfortunately for Matt, he decided to test the medical services on offer by head butting his teammates elbow……. resulting in a fairly nasty cut under his eye. We all wish Matt a good recovery – the blood from his eye clashed fairly severely with their tie dyed shirts! Our last game was tight all the way, and with 2 minutes to go it was 12 all…… then 13 all…. then 16 all. 10 seconds to play, last point. Alas, the Women of Wesley couldn’t find that magical last point, and went down valiantly with an effort that was highly impressive given the lack of previous experience. So the Women of Wesley were out, but a great night was had by all, and it is fairly likely there will be a return next year. Michaela is one of the members of our on-call roster, and has been part of the Wesley for a number of years. Being able to share in events like this further helps to strengthen the bonds within our larger on call group, and gives further opportunities for our doctors to discuss their very taxing jobs in a less intense environment. Jane is a frequent assistant for our doctors in various operations and caesareans, and is an important part of the greater eXXpectations team. Providing medical care is never just the doctor, and at the Wesley we have so many great people who assist and aid our doctors every day. Chris is the Deputy Director of Medical services at the Wesley, and is responsible for making sure the Wesley continues to be a great place to be (No pressure Chris…). Part of having a great hospital to work in is having a strong team to guide the hospital, and eXXpectations is very pleased to have a strong relationship with both Chris and Dr Luis Prado, the Director of Medical Services. eXXpectations strongly believe that the Wesley hospital is a fantastic place to work from, and provides women with a great environment for all of their obstetric and gynaecological needs. Thanks to everyone who donated to this fantastic cause. The team was able to raise over $1,100 this year, with the tournament raising over $ 130,000, making this year the highest fundraising year to date. Whilst much fun was had by all involved, the greatest result is that the work of the QCGC will be able to carry out further work in trying to reduce the rate and impact of Gynaecological cancers. eXXpectations congratulates the Cherish foundation on all their work in organising the tournament and looks forward to a return next year!